In the center of a dark room stands a cylindrical object resembling a well. It is filled with water to the rim. A vertical beam of light starts from the depth upwards, passes through the surface, sometimes leaving a trace, and reaches to the ceiling. There the beam stops in the form of a projected image circular in shape, identical to the object-well. 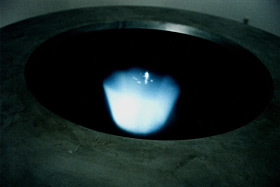 The image is that of the water surface seen from below and illuminated by the beam of light. A man and a woman alternately dive under water, approaching the viewers who look at the image on the ceiling and, using sign language, give a message which may be a story or a moral. The image on the ceiling is reflected on the surface of the water in the well. Every now and then, a drop of water falls from the ceiling into the well, briefly disturbing both the surface and the projected electronic image on the ceiling, as well as its reflection on the surface. 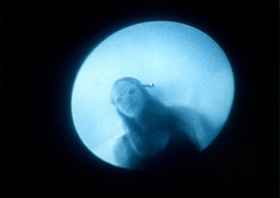 At that point, water and the image of water blend to form a single element and the viewers are caught between the two surfaces, finding themselves above and under water at once. Should a Dogon happen to be here, he would probably think he is at the very beginning of the world, between the lower dry water which is thought and upper moist water which is the word. The room itself could be a large well from which his own image is broadcast "live" and projected onto a higher and more distant surface. Because, as Bachelard claims, "the faith of every image is to grow".